It seems like it was just a few weeks ago that I was (nervously) contacting people on instagram to participate in my very first blog tour. 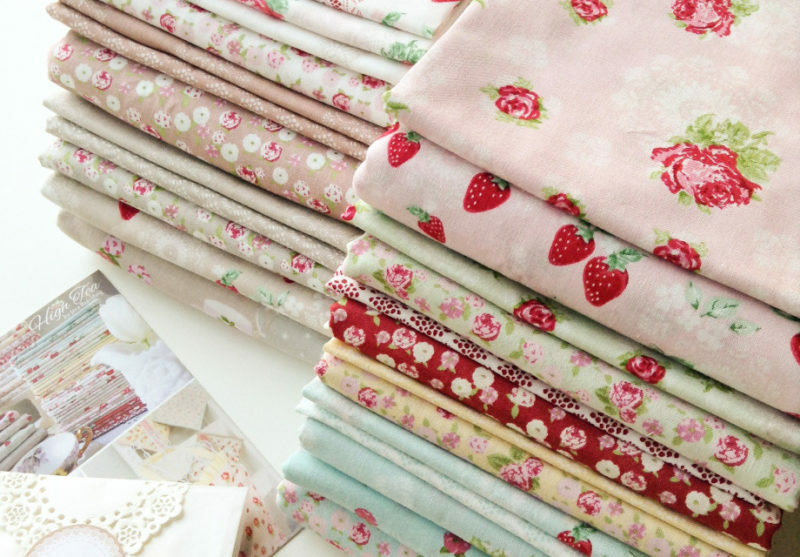 And now here I am recapping the final week (week 3) of all the amazing projects that everyone made using my first fabric collection, High Tea. Before I get started, I wanted to extend a very warm and heartfelt thank you to all the designers/makers that participated in making and sharing a project for my first blog tour. It meant the world to me, and I am forever grateful and thankful for the friendship (beyond Instagram) we have formed. On 8/21 I had the very talented Greg Jones of Grey Dogwood Studio. You can see his high Tea blog post, here. I’ve been a fan of Greg’s instagram for a while now, so I didn’t think twice about asking Greg to join my high tea party. His excitement to use my fabrics meant the world to me. I snagged all these gorgeous pictures from Greg’s blog. 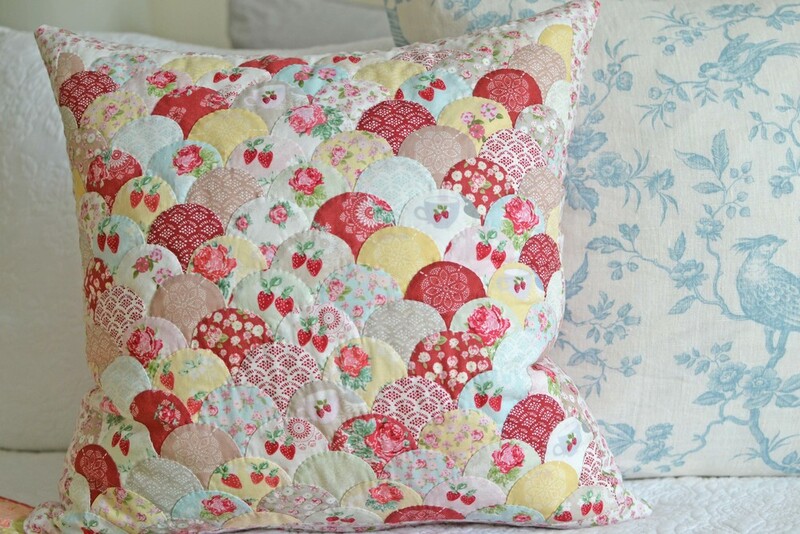 These paper-pieced scallops are gorgeous! 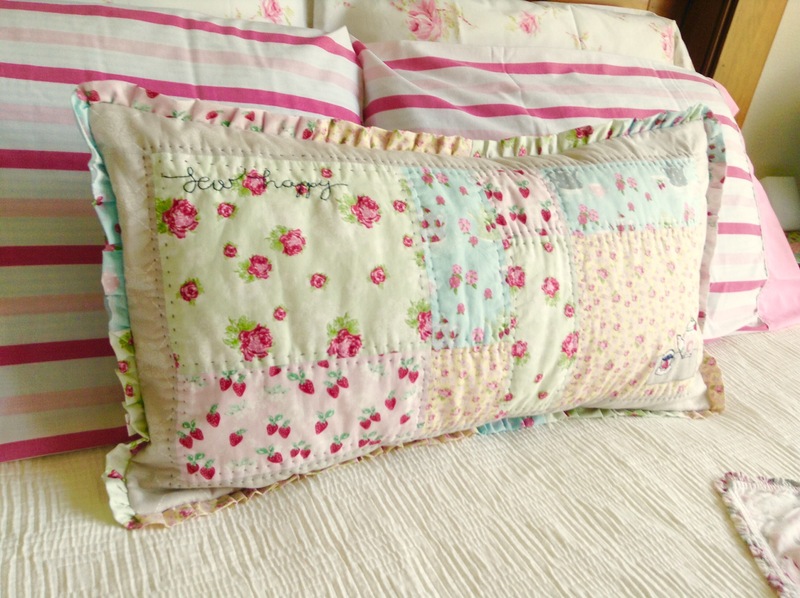 Greg also made a 2nd pleated pillow using this tutorial from my blog. I’m always happy to see older tutorials still being used! 🙂 Thakn you so much Greg for the beautiful projects! 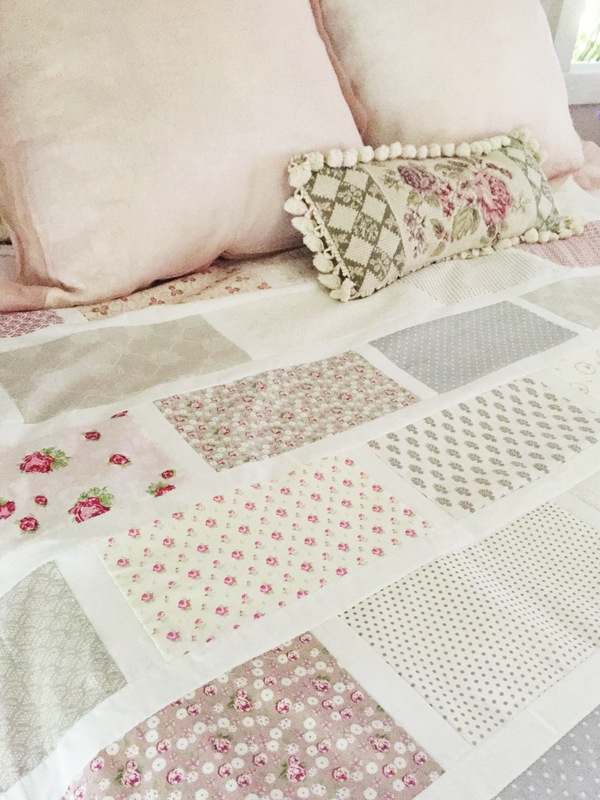 On 8/22 my friend Cristi of Whimsy Quilts shared this beautiful quilt. 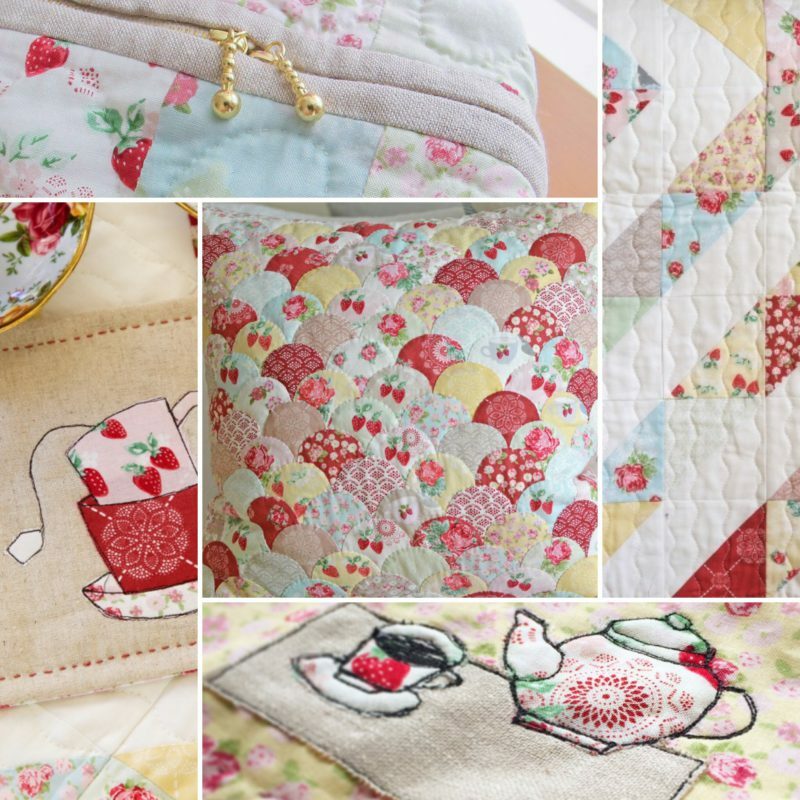 She mixed in some Tilda fabrics with High Tea to make this stunning, low volume quilt for her mother. Cristi is also from the Pacific Northwest, like me! 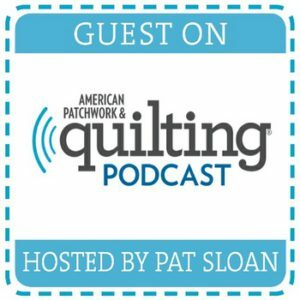 We met on instagram because I was always spending all of my money on her online shop, Whimsy Quilts and Fabrics. 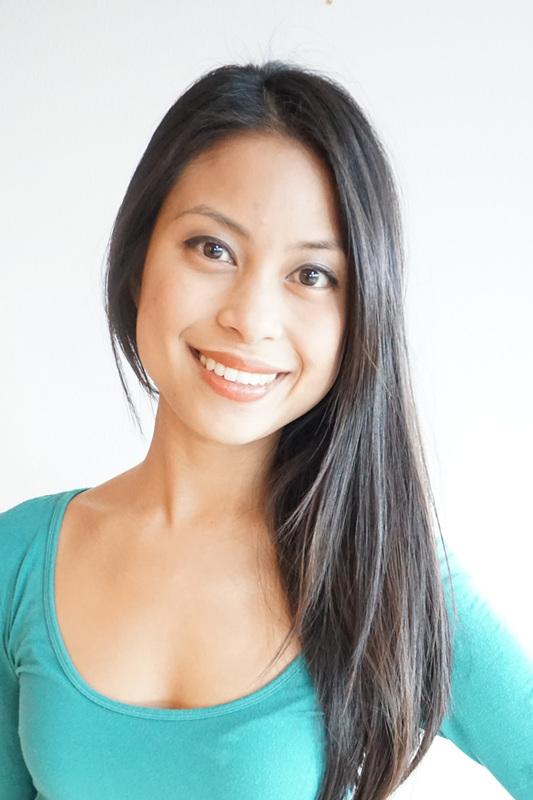 ;p She’s moving away from selling fabrics and towards other creative ventures such as her Modern Makers Pattern club. A busy mom to 3 beautiful kids and running her own business, I felt so lucky to have Cristi say “yes!” to participating in my tour. Thank you, Cristi! 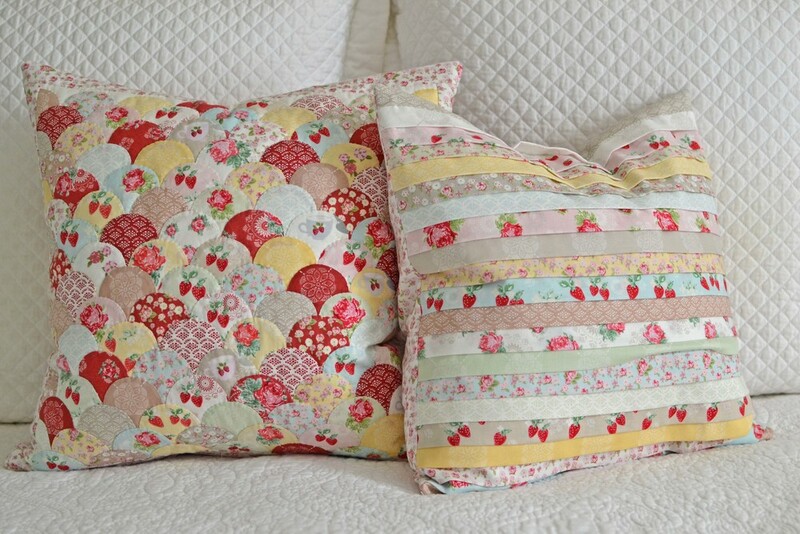 On 8/23 Kristin Esser of They Grow Up Too Fast shared several beautiful projects shown below. 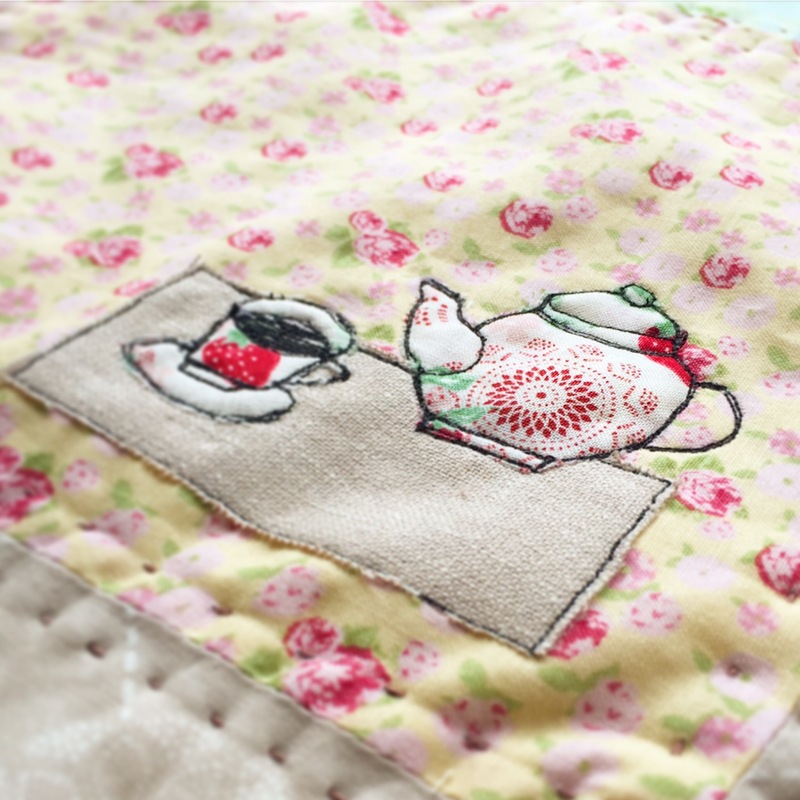 Kristin Esser and Minki Kim just came out with a fabulous book called Sew Illustrated, where I shared Minki’s amazing quilt that she made for her daughter in week 1’s high tea blog tour post. Kristin and Minki took so many gorgeous photos I had to share them all! 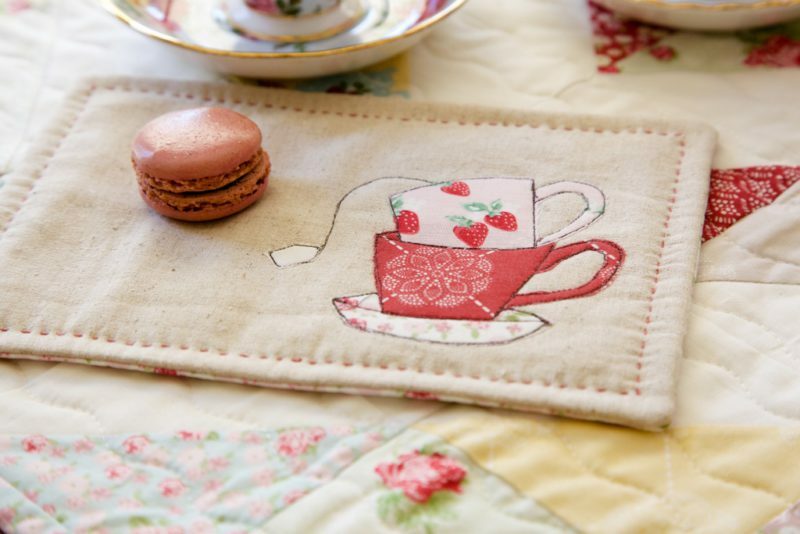 This adorable tea mat was made using the embroidery technique from their new book, Sew Illustrated. Macaroons, fresh flowers and tea! 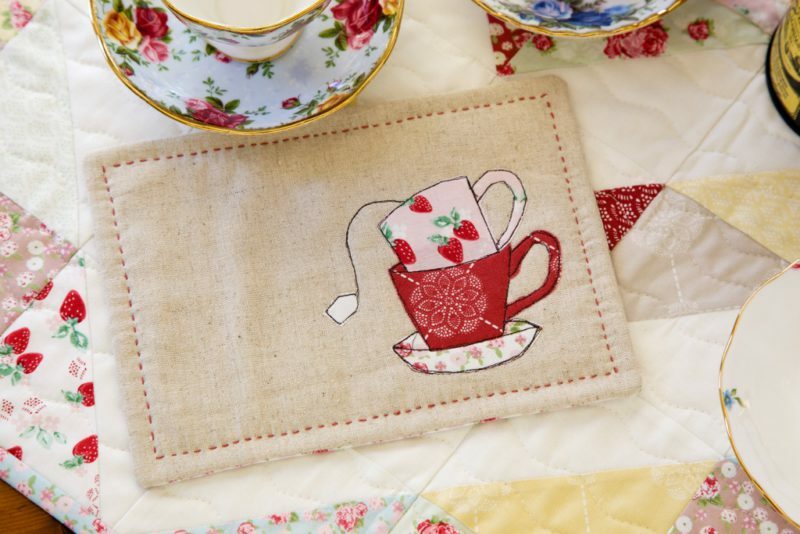 I think everyone needs to make time for tea. Looks heavenly! 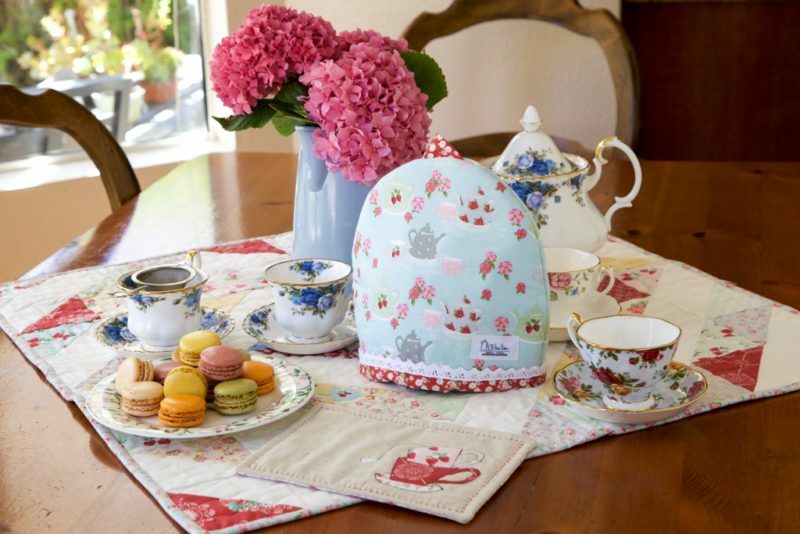 I love this tea cozy that Kristin made using the ‘tea time’ print in the cottage blue colorway. Love the lace details and red binding. 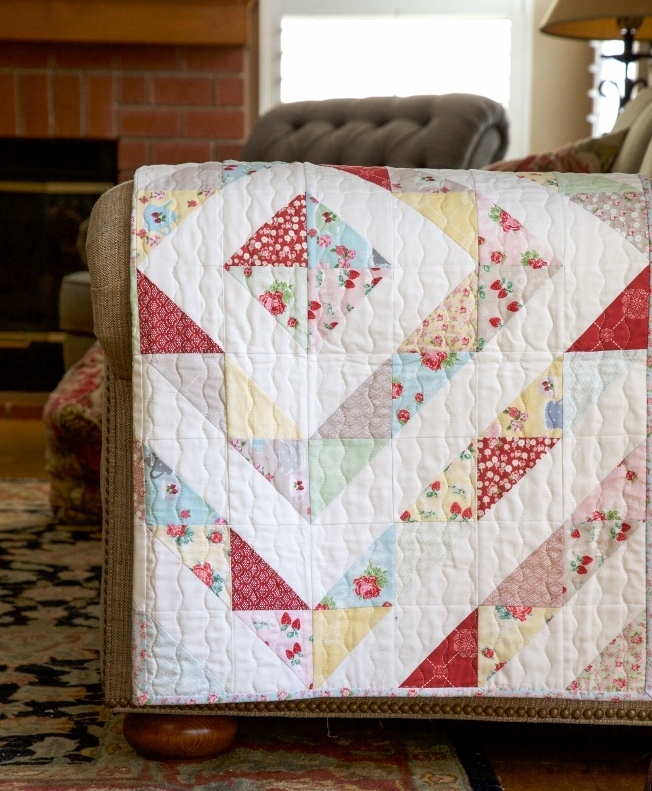 You can’t go wrong with a half square triangle quilt, it’s such of a classic and versatile design. 🙂 The wavy quilting makes it look super cozy. Thank you, Kristin, for all this loveliness! 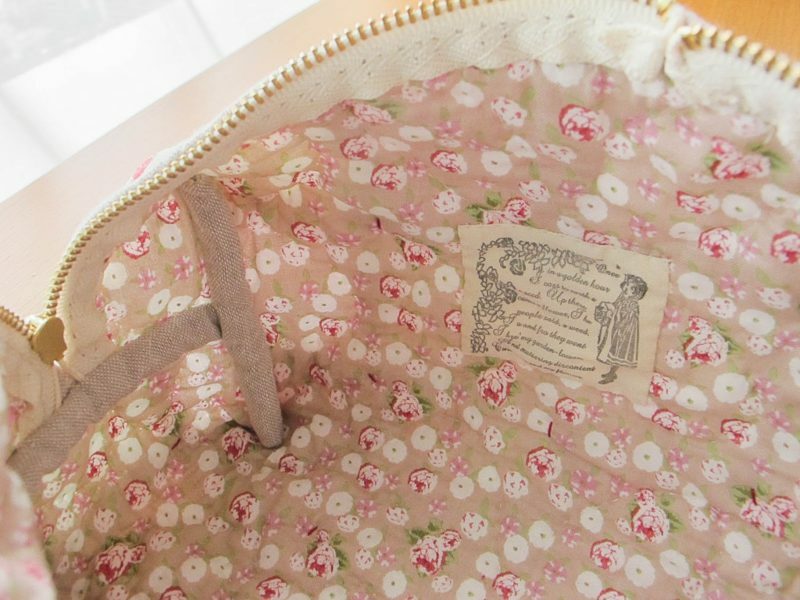 On 8/24 my friend Tiffany Behmer of www.FannyLuDesigns.com shared the following projects. 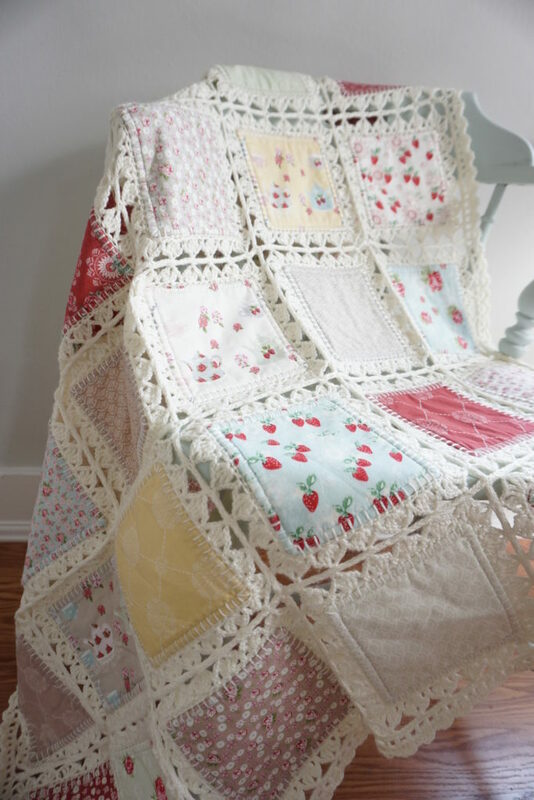 You may have already seen the infamous High Tea Crochet Quilt below, which Tiffany made a well-written and thorough tutorial just for YOU over at her blog. And yes, she finally was able to finish the tutorial – sorry for the delay on that, totally my fault! I was hoarding the crochet quilt in my home and she needed it back to reverse engineer the finishing instructions. Anyway, the updated and completed tutorial can be found HERE, thanks to Tiffany! My husband got me a crochet class at a local yarn shop months ago (for Mother’s Day, to be exact :-), but I haven’t had a chance to take it yet! 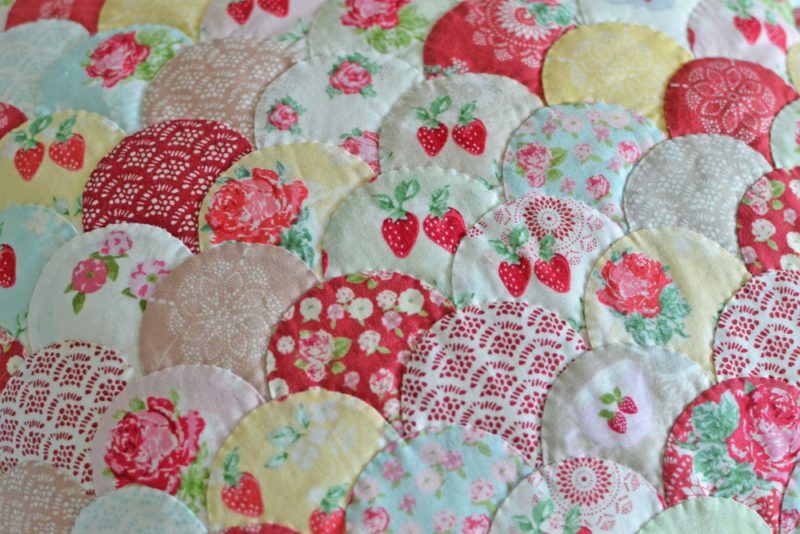 But one of these days I will so that I can start incorporating crochet to my quilting, because look at this loveliness! Isn’t it amazing?! 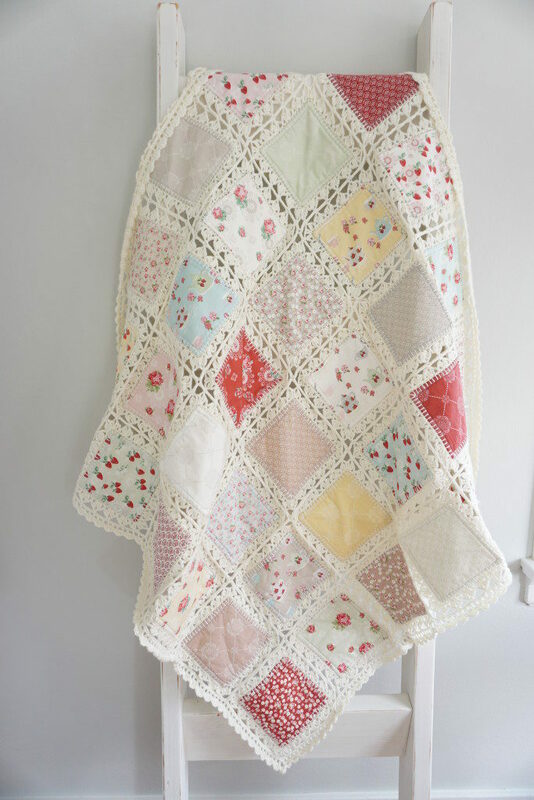 You can find more pretty photos and a link to the tutorial of this crochet quilt, here. 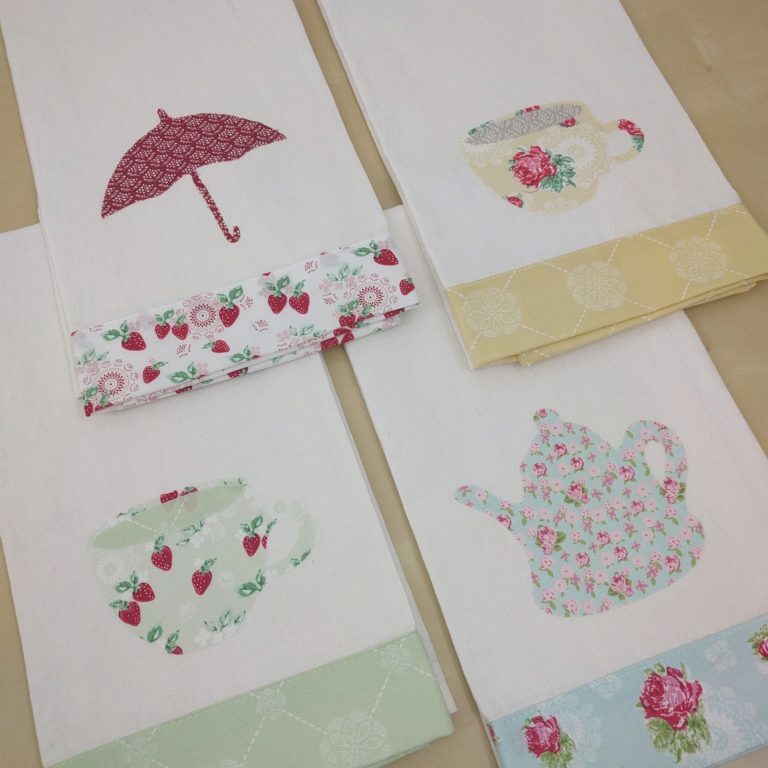 Tiffany also made these adorable applique tea Towels! So fitting for High Tea! 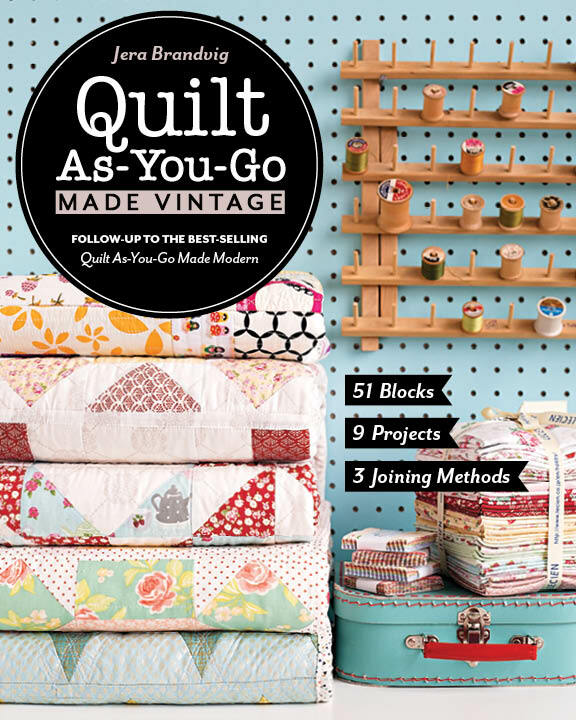 🙂 The crochet quilt and tea towels were both featured at Spring Quilt Market when I debuted my fabric collection. I was so lucky to have Tiffany’s help! 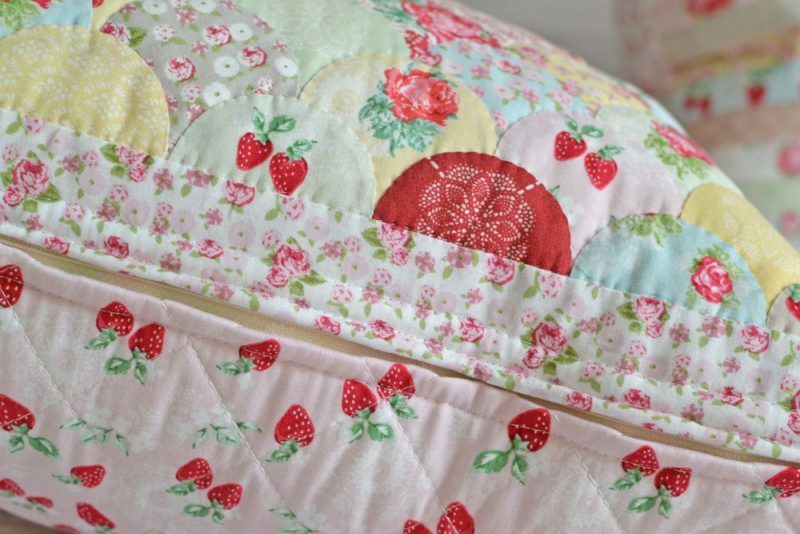 I just love seeing handmade baby gifts! These are baby burp clothes using the cottage blue and brown sugar colorways, which can totally work for a baby boy. 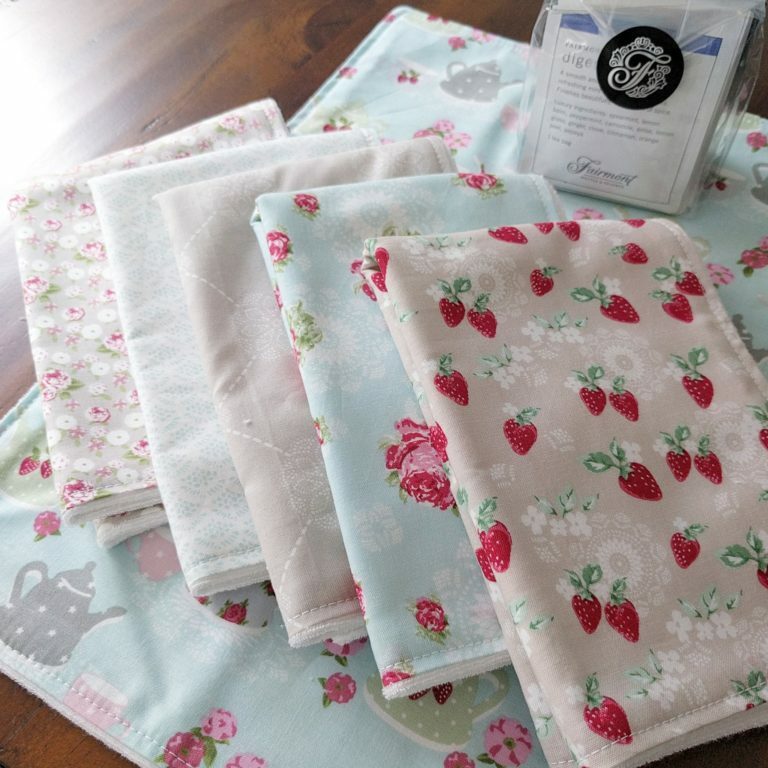 🙂 Be sure to check out Tiffany’s High Tea Inspiration blog post to see what other lovely projects she made using High Tea. Thank you, Tiffany! 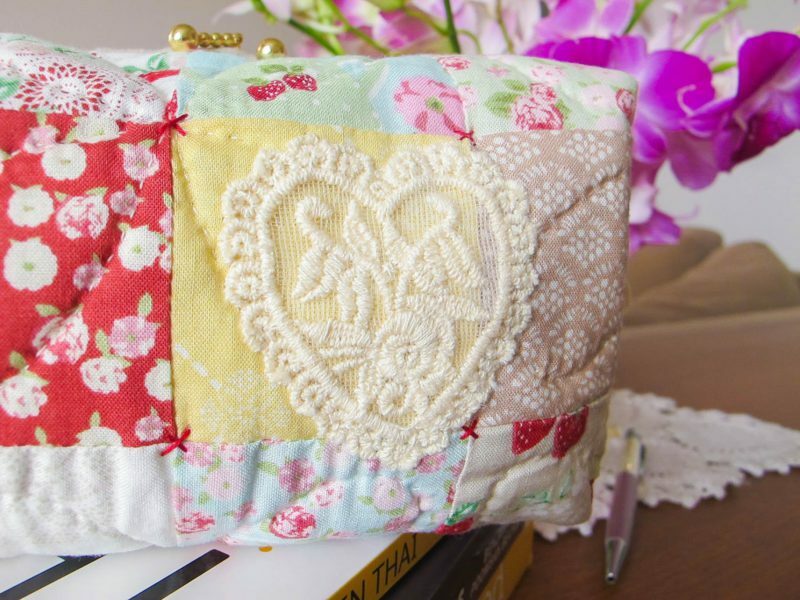 On 8/26, Veronica of Vivid Felicity made this lovely ruffle pillow that was hand quilted and embroidered with the cutest little tea cup detail! I snagged all of these beautiful photos from Veronica’s blog, where you can read more about her High Tea post here. Lucky me was gifted this pillow! 🙂 Thank you again, Veronica! 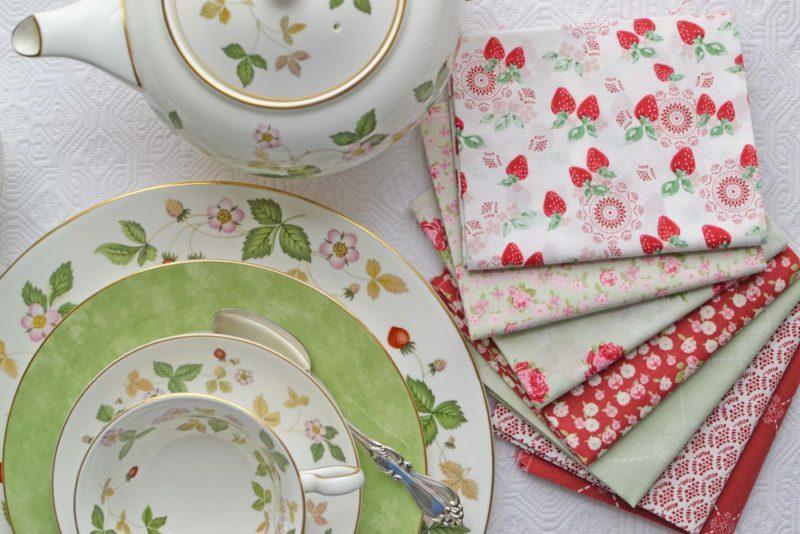 Had to share this lovely photo Veronica took of my High Tea Collection. And here’s that tea pot detail I mentioned. 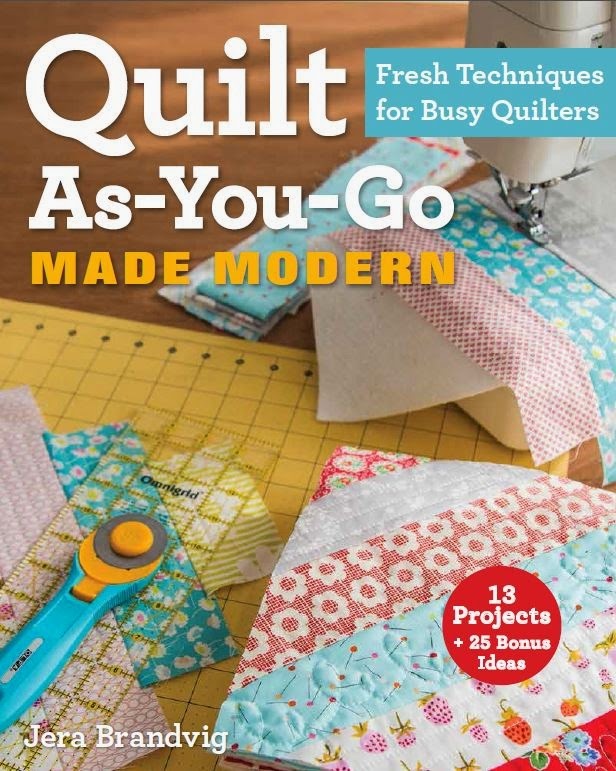 You can learn more about doing drawings with your sewing machine from this book, mentioned previously. 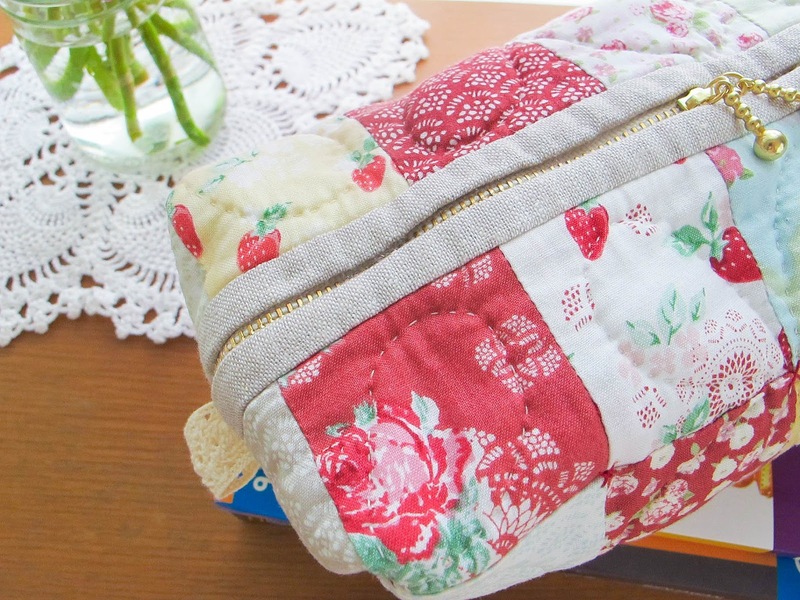 On 8/27 Wynn Tan of Zakka Art made this beautiful, hand sewn zipper pouch. Wynn is incredibly talented (and patient!) as she hand sews a lot of her projects! 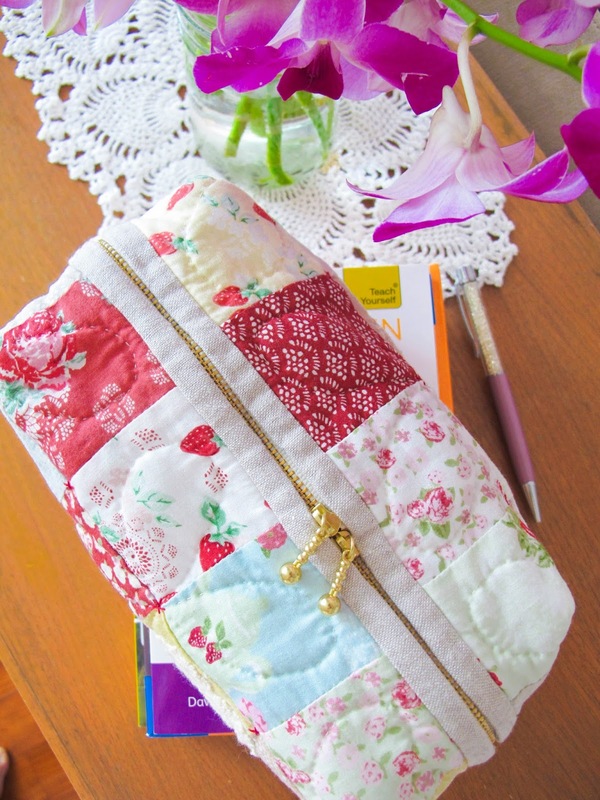 You can read more about this lovely pouch over at Wynn’s blog, Zakka Art. 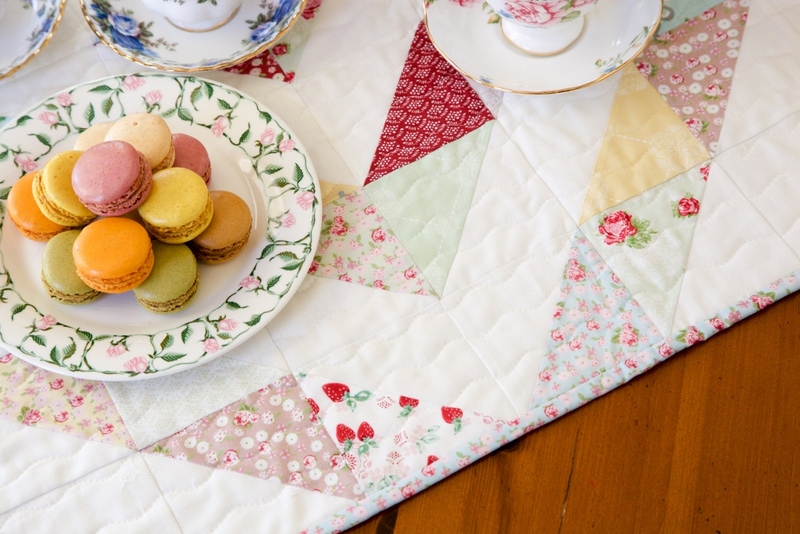 The details on all of these High Tea projects are just amazing! Here’s the inside of the pouch. 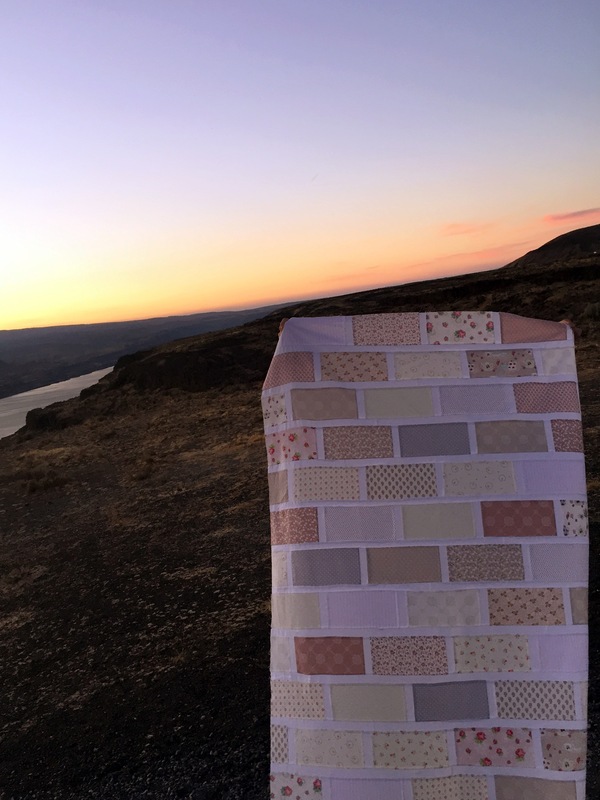 Thank you so much, Wynn, for the lovely project! 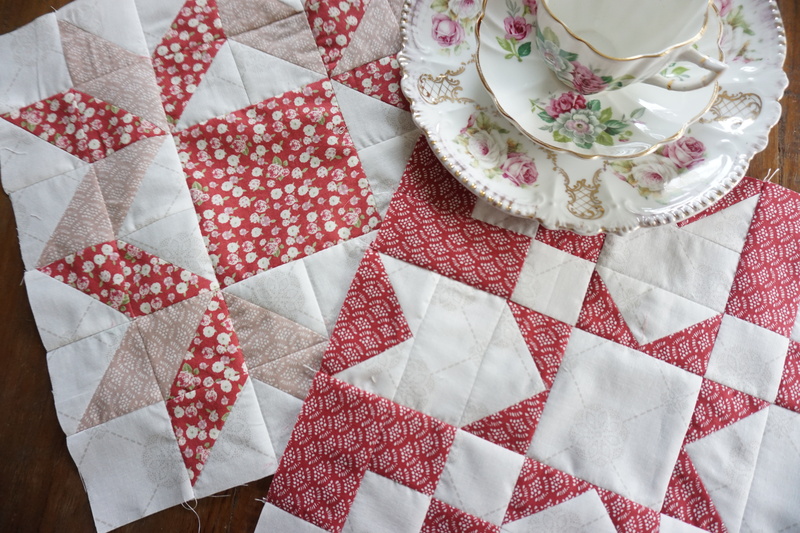 Lastly, on 8/28 I did my stop on the High Tea Blog hop! 🙂 You can read about that here. Whew! This concludes my 3-week High Tea Party! 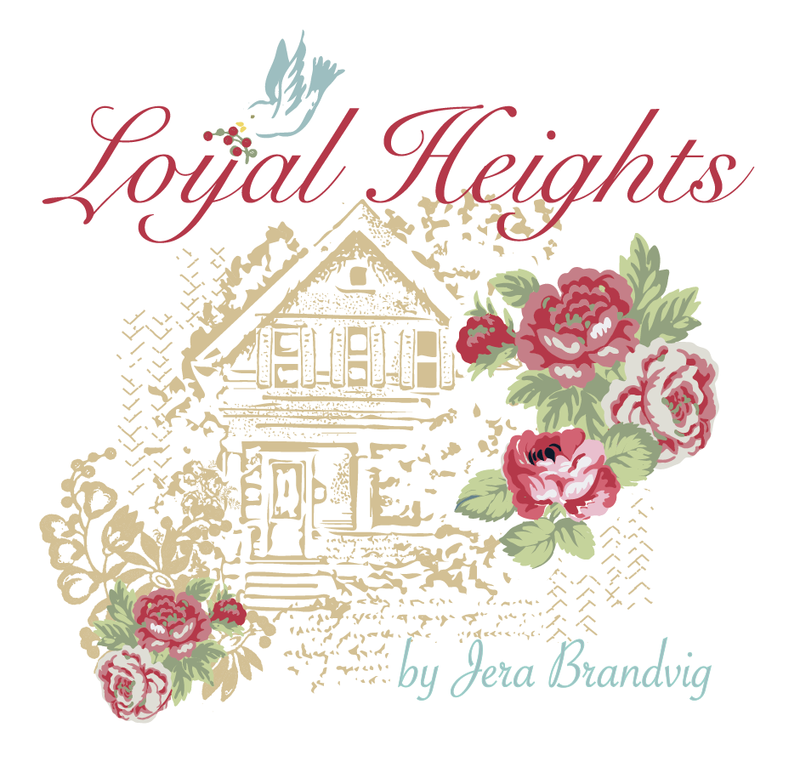 For a recap of each week, please see the links below, scroll down to the “High Tea blog Hop” on the right navigation bar under “Browse” for links to each week. Thank you so much for following along! 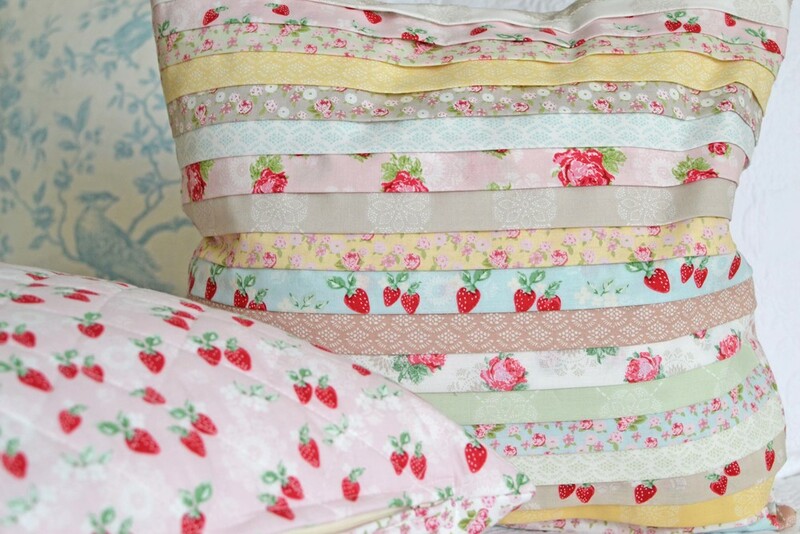 Seeing people use my fabrics is really something else…something I would have only dreamed of. 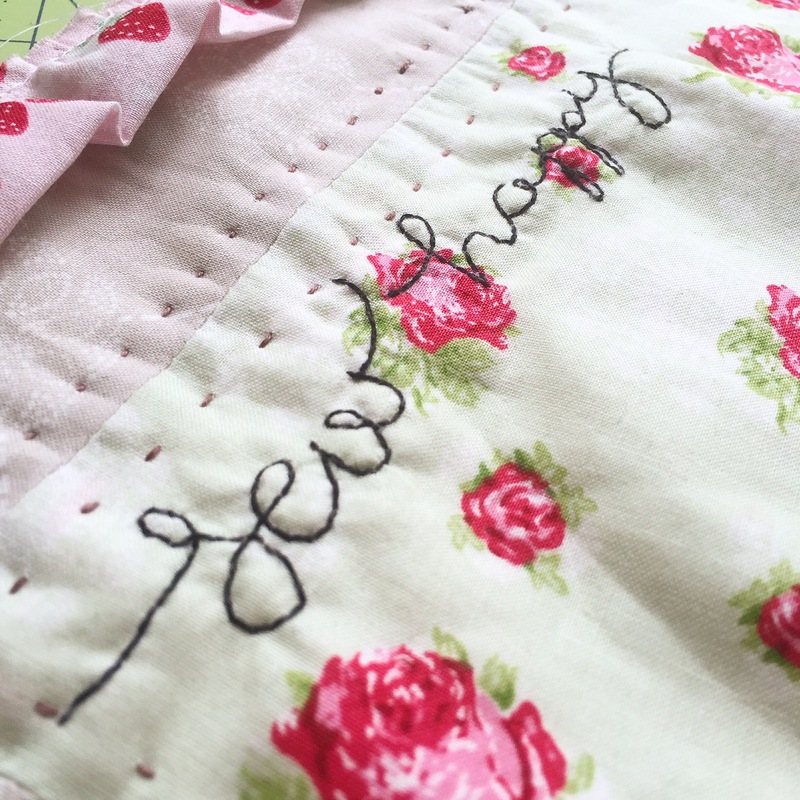 This blog tour has been a truly special and inspiring experience for me, & I cannot wait to design more fabric for people to make more lovely projects with! Thanks for reading me!